Easy Installation and Good Performance: this kit is mainly divided into there parts, just 5 minutes needed for quick self-assembly. High speed and powerful main board for printing works with smooth appearance and good quality. Automatic Function: supporting power outage recovery. The printer is shielded by its power supply from voltage spikes and power outages. If electrical power is lost, prints can be resumed from the last layer, saving time and reducing waste. Multiple Filaments: heated hotbed and nozzle with wide range temperature adjustments allow the printer to compatible with many 1.75mm filament types, likes ABS, PLA, HIPS, WOOD, PC, PVC and more. Standard Building Volume: with the printing size as 220 * 220 * 250mm, which makes the best of the building platform and gives you a full view of the printing details. Feature: equipped with a glass platform, very easy to take off the models, no tools to remove models, while the hotbed heats is up to higher temperatures, it provides even more adhesion. Exclusive Design: ultra-thin metal base only with 3.3cm height for stably printing and beautiful appearance, HD LCD display with 3.2 inch large size for viewing clearly and operating easily, higher modularization design is easy to move. Wide Application: can be used for art and culture, personal DIY, architecture, industry production, educational and medical equipment, children toys and other objects as you can image. 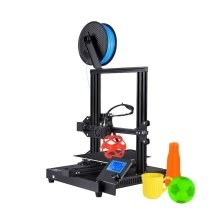 This 3D printer kit comes with a glass platform.